Not really.... I didn't move.... 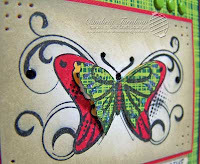 I just wanted to play with this stamp set AND the new sketch for today! Yep, it's Friday, and that means another fun sketch over at The Lounge. If you are stamping this weekend, come and play with us... you have three sketches to pick from! We'll draw a winner on April 1st and give away one stamp set of your choice! 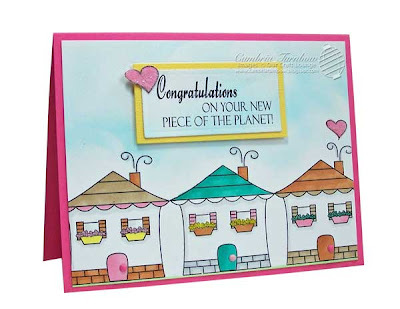 I used the stamp set New Digs, and the paper from Nikki Sivils called "Victoria's Street". The main image is stamped on the designer paper and colored with Copic Markers. I left the sign blank so you could write your new address in there.. but I'm not moving so hmm... well, it was fun to make! Sorry I didn't post much this week. It was Spring Break for my kids so it was hard to get much work done. Back to school for everyone on Monday though.. so that means back to work for me too! More dirty play time.... I actually did this one at the same time as the other one last week, but I just found time to get it together. I used my new paper from My Mind's Eye. I also got really brave and sponged the edges of the paper too. My friend Beate is so proud of me!! I just love this set... it's truly one of my all time favorite sets! 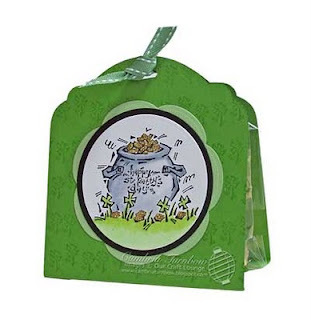 It's called Dandy Days, and the sentiment set is called Life Is. To get that cool look, all I did was smoosh my Ranger Ink pads right on the craft mat. I used Antique Linen, Peeled Paint, and Broken China. Then, I took a white piece of Neenah cardstock and smeared it around in the ink, and sopped up all the remaining ink. After I picked it up, there was still some white areas... especially around the edges, so I used the Sponge tool, and inked up the edges with Antique Linen and Walnut Stain. So easy... and the results are so much fun! 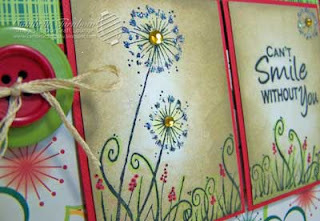 I added some Kaiser Rhinestones to the center of each Dandelion, and Sugar Crafty Sparkles around the edges. I used the stamp set Just Bugs. 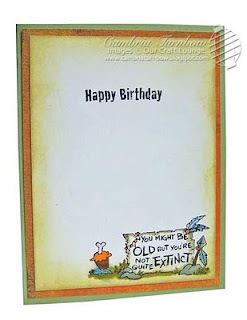 The designer paper is by Imaginisce (Lucy Bird), the cardstock is Bazzill. The cute little bee is covered with Black Eyeliner, and Lemon Drop Yellow Sparkly Fluff, along with Sugar Crafty Sparkles on his wings. The eyes have a drop of Black Sakura Glaze on them to make em pop. The flowers are cut out from the designer paper. I hope you have a great weekend! If you are stamping, make sure you head over to The Lounge and check out this week's sketch. Thanks for stopping by! It's Friday! That means it's another OCL Design Team Sketch Challenge! Another chance to win a stamp set from Our Craft Lounge. 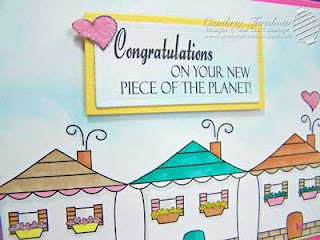 This week, the sketch is based on a card by the talented and oh so sweet Carol Halvorson... better know by her friends as HB. I love her, and I love her work... she's da bomb! I hope you can check it out, and play along with us! The last two sketches are open until the end of the month, so why not try them all? We'll pick a winner on April 1st. See all the details here, along with the sketch. I hope you have a wonderful weekend and you can find some time to get creative! Kisa and I will be down at MOT tonight for our monthly class.... so I'm excited to hang out with our girls! Thanks for visiting! Hello Stampers! Mr. Mailman brought me some new paper! Nothing like a box of new paper to make a girl's day! This Cosmo Cricket caught my eye right away. These are scraps, but I can't show you what I did with the other pieces until Friday for the sketch. You ready for another sketch? I'm ready.... I'm ready! (in my best Spongebob voice) I hope you'll join us. Hope you are having a great week, thanks for stopping by! See ya tomorrow for the OCLDT sketch! I had some scraps left over from my Dad's birthday card, so I decided to use them up... and why not get dirty while that stuff was out .. right? I can see why people like this style... it's fun, and there is a feeling of freedom once you get past the aspect of getting all inky AND that it isn't going to be perfect, but messy is what you are aiming for! I am a straight, clean kinda girl when it comes to stamping, but I think this is growing on me! 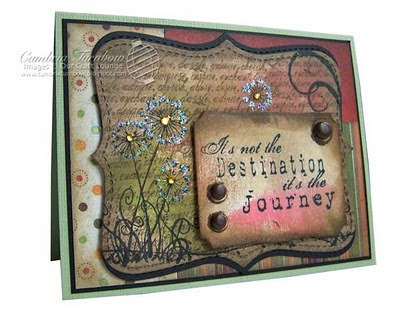 I used three stamp sets, Dandy Days, The Journey, and Love Notes. Click on the names to see the sets. I used the Ranger Distress inks Peeled Paint, Antique Linen, Walnut Stain, and Fired Brick. All I did was smear a bit of each on my craft mat, then smear the paper around in the ink to sop it all up. Then, I took some Antique Linen ink and grabbed it off the mat with my Ranger Sponge Tool to fill in spots (using a circular motion), then did the same thing with the darker Walnut stain around the edges. 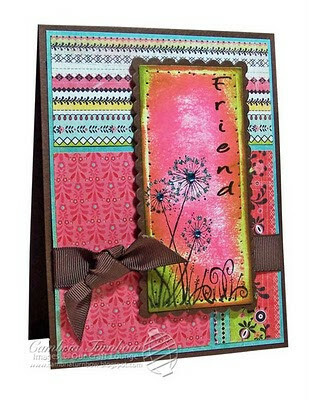 I stamped the word background from the Love Notes set using the Antique Linen, then stamped the rest in Soot Black. I added some Sugar Crafty Sparkles with my Quickie Glue Pen, and a Kaiser Rhinestone to each center. The sentiment is done the same way, then cut out with a Nestie. I added 7 Gypsy brads to the inside of that stamp circle and raised the entire piece up with foam dots. I hope you are having a great weekend! Thanks for stopping by! Hello Stampers... hope you are having a great weekend so far. Sunday is my Dad's birthday. We are going out to dinner later today to celebrate, then back to the house for cake and ice cream. My kids love singing happy birthday and of course having cake and ice cream. 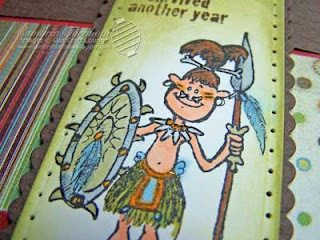 For his card, I'm using the OCLDT04 Sketch Challenge over at The Lounge. I used my Ranger ink and distressing wood tool thingy with my craft mat to add the ink around the edges, then I colored and added all the sparkle and shazam after. 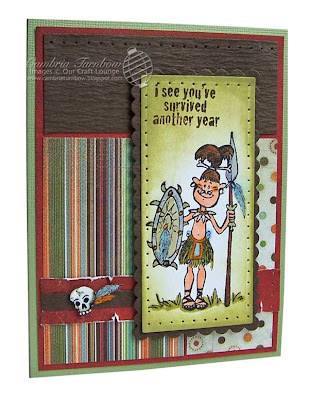 I used the stamp set from OCL called The Tribe... it's one of my favorites. I used Sparkly Fluff on the feathers and some of his garb, plus Clear Sakura Glaze on the bones. 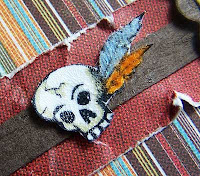 I even added some Distress Crackle Paint to the skull on the side. 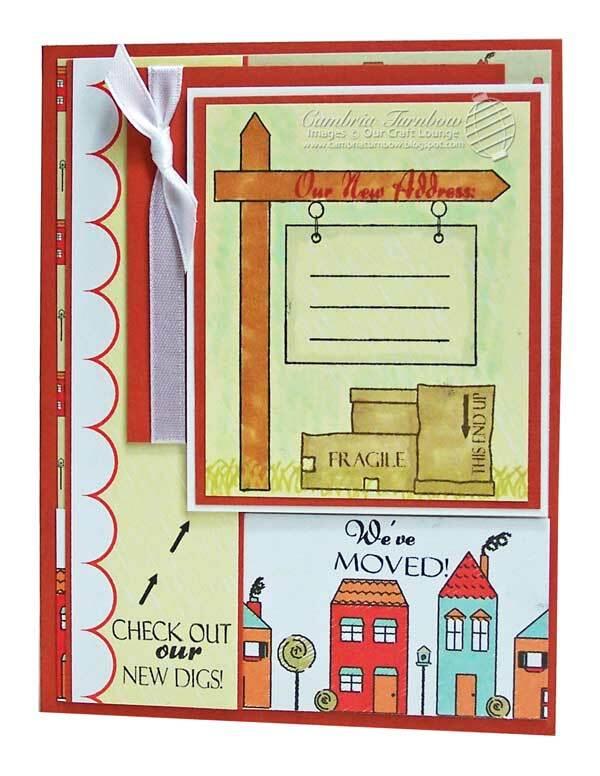 The cardstock base is Pickle from Bazzill. 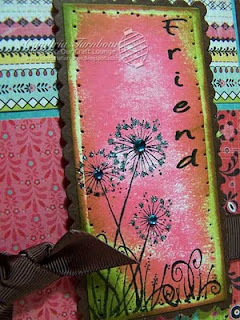 The designer paper is from a 6x6 paper pad by Basic Grey called Mellow. That cool wood looking cardstock I got from the Paper Temptress. It came all textured like that... love that stuff! You can click on the photos for a closer look. It's not too late to come and hang with us over at The Lounge. Both sketches (OCLDT03, OCLDT04) are still open for the drawing on April 1st. Plus, there will be another sketch posted on Friday! We are having so much fun... we'd love to have you join us! Okay, so I used the stamp set called Dandy Days and Say it Big, by Our Craft Lounge, and the ink colors Peeled Paint, Worn Lipstick and Soot Black. 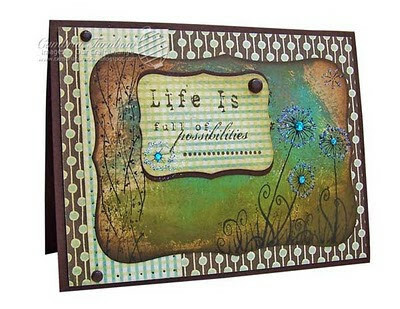 The designer paper is from Basic Grey Urban Prairie 6x6 pad and the cardstock base is from Prism. I added Cosmo Crystal Crafty Sparkles with a Quickie Glue Pen to the outer edges of each dandelion and a Kaiser Rhinestone to the centers. Are you stamping this weekend? We have a fun sketch challenge every Friday over at The Lounge. We'd love for you to join us! Click here to check it out. I'm not so sure I really like how this turned out, but I'm not a big yellow fan... maybe I should try again with pink? 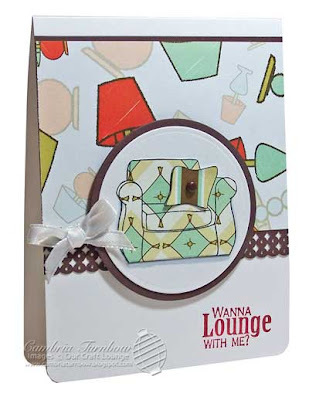 :) I loved this week's sketch at The Lounge, based on a card by my friend Valerie. So, thought I'd squeeze in one more before a new sketch is posted tomorrow. It's not too late to play along, in fact, you have until April 1st to try any of the sketches posted this month. I used the stamp set called Spring Sketches and I curled up the petals using that technique I learned from my friend Tosh last week on her blog. I stamped and cut out three flowers. 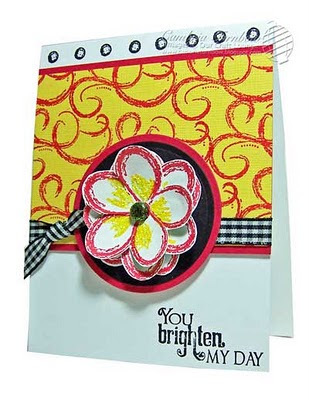 The center is covered with Lemon Drop Crafty Sparkles for extra pizazz. I used Brilliance ink, Sunflower Yellow and Rocket Red. Can't wait until tomorrow.... it's another great sketch from one of our DT members! I hope you can play along! Need a little gift to drop on someone's desk at work? Want to send a little treat to the bus driver or a teacher at school? This was super easy and fun! 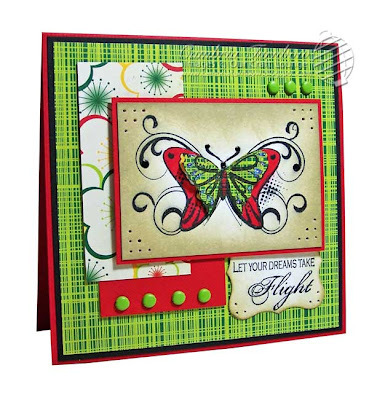 It's a Sizzix card die, called Ornate #2. It's scored in the center, so I lined up that center pre-scored line on the 6 mark on my Scor-pal, then scored one inch out on each side of that, on the 7 inch mark and the 5 inch mark. Then, make the pre-scored line a mountain fold.... you've bot a little treat cover bag. This one has Hershey Gold Nuggets inside. 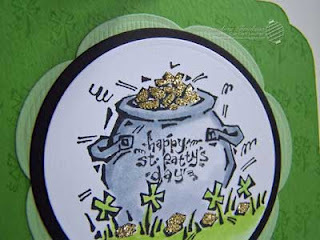 The stamp set is called Irish Blessings from Our Craft Lounge. I added Butterscotch Crafty Sparkles all over the loot. The image is on cardstock cut with my Nesties and the image is colored with Copic Markers. Remember last week, when I made another card very similar? I did it again, but this time using my favorite Lucy Bird Designer Paper from Imaginisce. I know it's almost exactly the same, but I can't tell you how much I love these new sets from OCL, called Big Thanks and Fancy Fringe. There are just so many ways to say thank you.... nothing better than a handmade card though... right? Are you ready for another sketch challenge? 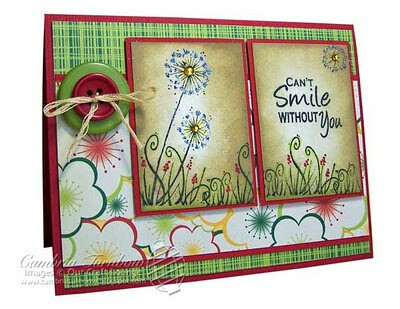 This week, our sketch is based on a card from one that my friend Val from Cal designed. I LOVE her card... I actually got one in real life too! Thanks Val! Want to play along with us? Want a chance to win a stamp set? Want to see her awesome card and the sketch? Just click here. We are having so much fun seeing all your creations! We'll draw another winner on April 1st! I got a brand new 6x6 paper pad from eP yesterday! I love packages from eP! The paper is called Victoria's Street by Nikki Sivils. LOVE IT! I bet you are just happy I'm not using Lucy Bird this time huh? Well, I can't promise you that I'm done with Lucy Bird, but I do really love my new pack! 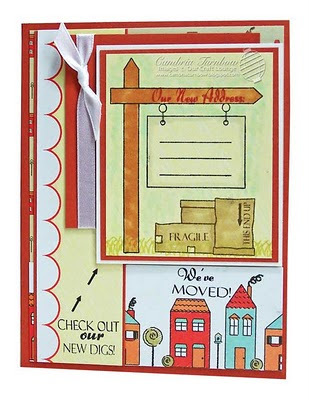 It goes perfect with the stamp set Live Laugh Lounge. I paper pieced that comfy chair with two coordinating papers, then added a brad as the button for the pillow. I did a little shading with Copic Markers, but other than that it was super easy! 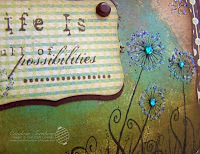 I used Brilliance Pearlescent Poppy ink for the sentiment. 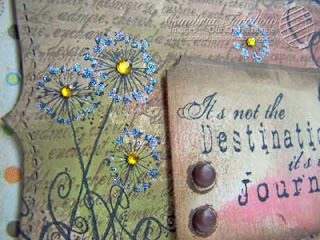 And oh yah, I used my new border punch from EK Success too. Dang it... I just remembered that I was going to Sparkly Fluff that pillow brad! I'm going to do that before I send it off... so pretend that button is all fuzzy and sparkly will yah? Have a great weekend everyone! Thanks for stopping by! I hope you can play along with our sketch challenge! Hey stampers! Today, I had a chance to stamp! I love it when I have some time to just sit and piddle. Well... okay, so I didn't really have much time, but after reading my friend Tosh's blog, I was inspired to try a flower. Mine isn't near as detailed as her gorgeous creations, but it was still fun. Click here to see Tosh's flower tutorial. Amazing isn't she? When I was at MOT this weekend, I bought ANOTHER EK Success border punch.... I'm telling you... it's an addiction. Oh, wait, I bought two. Yah, I guess it was two more. Anyway, this was one of them. I added a piece red cardstock behind it to make it pop. The designer paper is from MME Abbey Road. 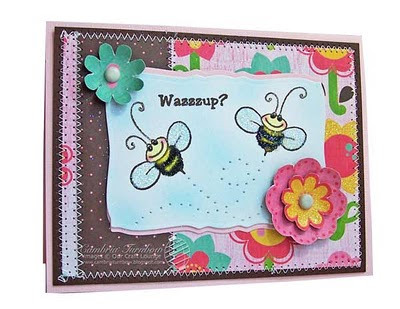 I used two stamp sets from Our Craft Lounge one called Big Thanks and the other called Fancy Fringe (the border along the bottom and the dots on the center of the flowers). 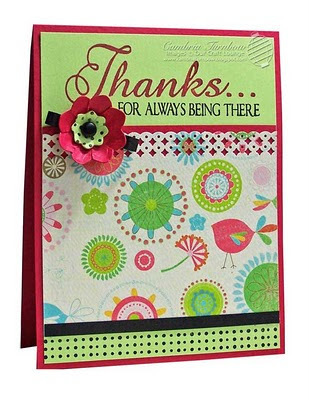 I LOVE the Big Thanks set... because there are so many options for saying thank you. We picked our first winner for the OCLDT sketch challenge today, but you still have a chance to win with the sketch posted on Friday for next month. There is also another sketch challenge over on the MOT blog. Copic Creations is also having a fun challenge. SO many chances to win OCL products! :) I hope you'll play along! Hey Stampers! I hope you all had a great weekend! I had THE best Saturday, hanging out at Memories of Time with our girls. Class was CRAZY.... but fun! I can't tell you how much I adore "our" girls. Kisa and I just love teaching at MOT. Remember I told you I was having a hard time with the OCLDT sketch from Friday? (there is still time to play with us!) Well, this is one my attempts. I didn't think it was close enough to the sketch, so I started over, but I did like how this card turned out. I LOVE that sentiment.... piece of the planet. It makes me smile. I used the new set called New Digs. The flowers in the flower boxes and the hearts are covered with Sparkly Fluff. I made those clouds with a cloud stencil and my Copic Air Compressor. The little door handles are mini brads from Bazzill. I used my Long Rectangle Nestabilities and cut out the sentiment and raised it up with foam dots. 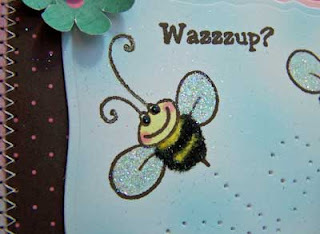 The cardstock is Bazzill and the white is Neenah. You can click on the photo to see a larger view. Psst... there is some fun new news over at The Lounge today! Stop by and take a peek if you can.